Holiday Inn General Manager Stella Jacobs announces the Oktoberfest by the River to be held on November 4, 2013. The Holiday Inn Chiang Mai will hold a German extravaganza Oktoberfest on November 4, 2013 featuring German sausages, wienerschnitzel, pork knuckle and, of course, German beer. Stella Jacobs, General Manager of Holiday Inn Chiang Mai , announced that Holiday Inn Chiang Mai together with Paulaner Beer and Bangkok Airways cerebrate the famous German Beer “Oktoberfest by the River” on Monday November 4,2013 from 6 pm-10.30 pm held outdoors at the River Pavilion , Holiday Inn Chiang Mai. You can enjoy Paulaner Beer from Munich, Germany. As you listen to the German band Anton & The Funny Guys. The Rio Restaurant and Wine Bar at RatiLanna Riverside Spa Resort is offering a daily buffet of its famed Churrascaria Brazilian style barbecue buffet offering such foods as salmons, squid, chicken, pork, beef and lamb grilled on a skewer. 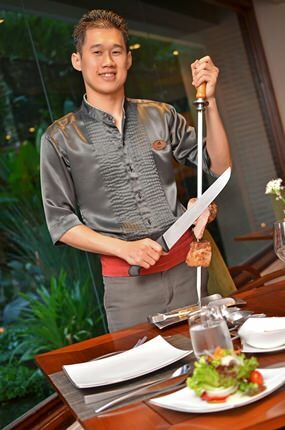 Waiters bring the grilled foods to your table skewered and cooked to your taste. The Rio Restaurant’s open kitchen and grill area allows the skills of their professional chef on display and the special Tuesday special of buy one wine, cocktail or beer and get one free or the Thursday’s deal of a free bottle of wine for a party of four make the 599 baht price a great deal. Monday and Wednesday’s price is only 500 baht. Open 6 p.m. to 11 p.m. nightly. The Mira Terrace offers Sunday barbecue dinners for the same price. For reservations or more information call 053-999333. (PR). Here one of the killers talks about his role in the murder. The Laramie Project is a play based on interviews of Laramie Wyoming, USA, taken after the brutal torture and murder of a young gay man, Matthew Shepard. Matthew Shepard was an openly gay student at the University of Wyoming who was beaten and tortured and left for dead tied to a fence on October 7, 1998. He died a few days later from his injuries. His death led the way for sweeping changes in hate crimes laws. The Laramie Project is the latest project of the Gate Theater and is a moving and sadly tragic story of a town trying to explain itself to the world. The play is by Moisés Kaufman and members of the Tectonic Theater Project who drew on hundreds of interviews with locals and their own journal entries. The 3 act play has a group of actors skillfully switching characters as they relive the run up to the crime and include such people as the leader of the Westboro Baptist Church who came to Laramie to picket the funeral of Matthew Shepard. Performed at Kad Suan Kaew, the Gate Theater once again excelled, this time in a compelling and haunting portrayal of hate crimes. The play also features narrators who keep the threads of the story tied together. Fred Phelps is portrayed in the play, the leader of the notorious Westboro Baptist Church that picketed the funeral of Matthew Shepard.